While we were discussing to whom we could give our latest Award, it was not difficult to choose! 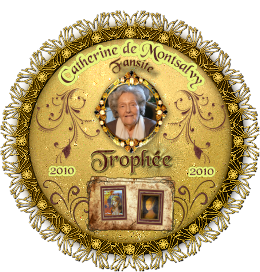 Since our dear Juliette Benzoni will celebrate her 90th birthday on 30.10.2010, it seemed the perfect occasion to surprise Juliette, with our Catherine de Montsalvy Award. The beautiful creation made by LaLuna (my sister), will be put on a ceramic plate and given in person to Juliette! Therefore, it is with great joy, we announce that we have chosen Juliette Benzoni as our latest AWARD winner. It is our way to say thank you, for her generosity to share with her faithful readers, so many souvenirs and for the joy she gave us, writing her wonderful books. p.s. with great joy and with tears in her eyes, Juliette Benzoni received the Catherine de Montsalvy AWARD while Frédérique and I were invited at her home in Saint-Mandé on her 90th birthday. 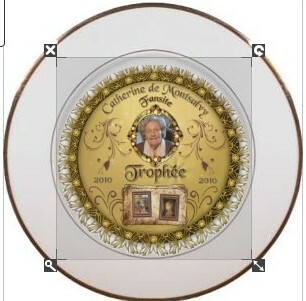 While the idea of the AWARD was born out of enjoyment for the Catherine site, I never dreamed that I would one day have the extraordinarily honor to show my gratitude with a prize to my all-time favorite author Juliette, who had accepted the Trophy with so much grace as if it really came from a distinguished organization.